[title maintitle=”Caring for Your Kitten” subtitle=”The first few days”] So you have decided to get a new kitten and now is the exciting time for your new friend to come home with you. So what do you need to know about caring for your kitten in the first few days in its new home? Kittens are extremely fun but they are also extremely inquisitive and will find their way into any little nook or cranny. Before you get your new arrival it’s often a good idea to do some “kitten-proofing” around your home. First of all make sure doors and windows will be closed when they arrive – you definitely do not want your new pet to get lost outside the house. Also check for any holes or gaps where your kitten can crawl into – for example entrances to pipework or behind kitchen units. It’s often a good idea to prepare a quiet area for your kitten in a quieter room as well. Being in a new home with new people and away from it’s mother and litter-mates can be quite daunting and while your kitten will probably want to play and be with you; it might also need some quiet time in order to not be overwhelmed. When you go to collect your kitten, you will probably be bringing it home via car. This will be probably be your kitten’s first time in a car and therefore they may be scared. Don’t bring your cat home on your lap – if the journey spooks your kitten, it can hide out anywhere and it can be dangerous. Therefore get a nice cat carrier with a soft bed inside so that your kitten can settle down and probably go to sleep. A cardboard carrier might not be the best idea as your kitten might also urinate during the journey and this could break the cardboard carrier. Also keep the car cool and if it is a long journey make sure the kitten has some water. You will want to have food and water ready for your cat. One of the things to think about is stability of the bowl as your new kitten may step on the edge of the bowl initially and if it is full of water, this might tip over your floors. Therefore look at some stable bowls. Ceramic bowls are very good as they are resistant to kitten claws and teeth and very easy to clean. Stainless steel and plastic are also pretty good – the stainless steel ones can get scratched over time and the plastic ones are not as long lasting as ceramic. It is a good idea to find out what food the kitten was eating before you took it home and use this food for the first few days. Changing your kittens food straight away can upset its’ tummy so it is a good idea to introduce any new food slowly. Cats are naturally clean cats and will often find their way to their new litter tray as more often than not your kitten will already be litter trained. Initially you can use a small, low sided tray and then if your kitten will be an indoor cat invest in a more useful design later on. In the first couple of weeks though a low sided tray is useful so that your kitten can enter the tray easily. There are many types of litter on the market but initially go for a litter that has very little smell as a strong smelling litter may put your kitten off. If you want a self cleaning litter tray then you can try out our number one recommendation. This litter tray has a useful step up into the dome so it is easy to be used for kittens and older cats. When you arrive home with your kitten, place it in the litter tray so that it gets an idea of where the tray is. In the first few days your kitten may want to use the tray more often so site the tray somewhere which is a little quieter but easy to access as a kitten likes to feel secure. To continue with litter training, place your kitten in the tray after meals and when it wakes up as these are the times when your kitten will usually require the toilet. If your kitten does have a toilet accident, don’t punish it – accidents do happen and punishing a kitten will mean that it will be too scared to use the tray and it also will not understand the punishment. Instead just clean up the area, there are a number of sprays that are on the market that break down the smell of urine so the kitten does not think that this is their new toilet area. Even though your new kitten will want to play a lot, kittens do also sleep quite a bit in the first few weeks. Therefore, a nice comfy bed in a quieter area or “safe” room is often a good idea. But don’t be surprised to find that your kitten might find other things to sleep in rather than the nice, expensive bed you have bought. Quite often a cardboard box will be your kitten’s favourite place to sleep. And soon they will find their way to your sofa or bed. Cats love to scratch and sharpen their claws. So to protect your furniture, the earlier you teach your kitten to use a scratching post the better. Scratching posts can be made from sisal or pieces of natural wood. Often they will come with a dangling toy and this encourages the kitten to grab the toy and therefore the sisal post. You can also support your kitten’s hindquarters and pick it up and gently rub its front paws down the post. 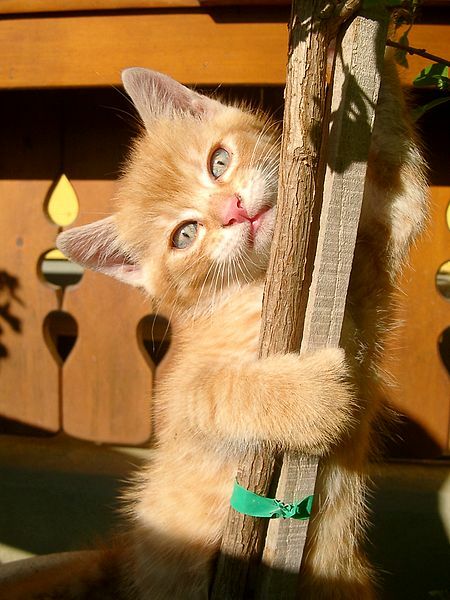 Have a look at our number one recommendation in scratching posts. This is a perfect post for protecting your furniture. Kittens love to play so have a range of toys ready for them but make sure there are no small parts or broken bits that they can swallow. Also make sure they cannot get into plastic bags as the noise of these excites kittens but they can suffocate or get the bag wrapped around their neck. Playing with your cat will start the bonding exercise and this will be the start of a life long friendship. 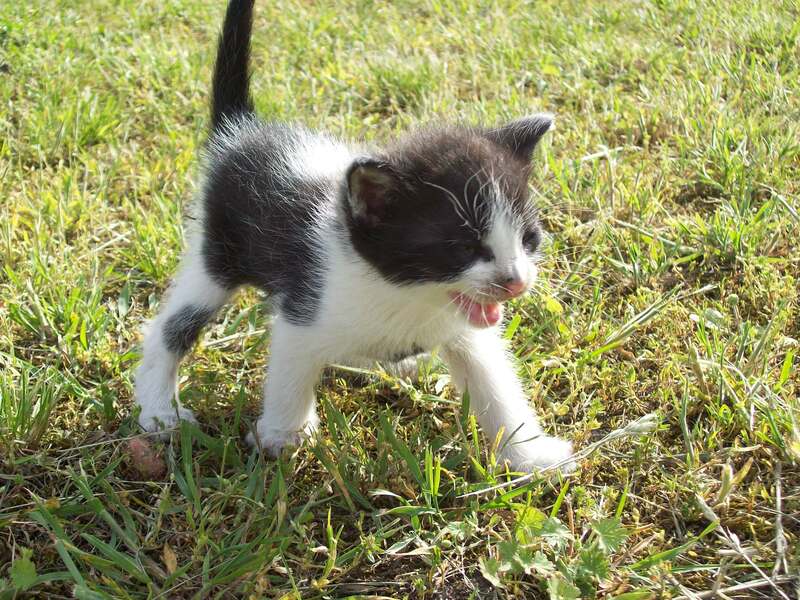 Roll a ball around the ground or even use a fishing rod for your kitten to chase. They will love dangly things or things that make noises or things that they can pick up in their mouth. Also start grooming your kitten, the earlier you do this then the sooner the kitten will get used to this. Never smack your kitten – it does not understand why you are punishing it and this can cause your kitten to become afraid of you. Allow your kitten to sleep in a safe, quiet area at first – remember your kitten will want to play a lot but will also need a lot of sleep. Do keep your vet’s telephone number close to hand – accidents can happen and your vet will always give you advice. Never let your kitten or cat play with plastic bags. Talk to your kitten soothingly – it will be nervous at first. If your kitten wants to hide somewhere dark and quiet at first – leave it come out on its own accord. As you see caring for your kitten is not difficult. But how you interact with your new kitten in these earlier days will help nurture your bond for years to come. I hope that you have a great time with your new cat. If you have any stories about the first few days with your new kitten then enter them below – we would love to hear them. I would just like to thank you for providing these really helpful tips on caring for a new kitten. My 6-year-old daughter wants a kitten or a pet fish. I am glad I found your article as we were leading more towards a pet kitten. I will be sure to save your useful tips so that we may be able to better care for our new kitten when we eventually make up our minds to get one. Great posts! I love animals and cats as well! I remember when I had my cat she would be very shy at first because she was the runt of the litter. But as soon as we play with her, she got more comfortable and our bond grew from there. A lot of great advice you have on here for new cat owners. Aww that sounds like you had a great cat friend. My last cat was the runt of the litter and lived to be a great 20 years old – and still acted like a kitten. Hi, keep doing the good work you have already done, i think your site looks very clean and neat and captures the reader with nice images and text. Thank you for your excellent and CARING tips for preparing your home for a new kitten. You really show your heart and care for these little sweethearts who have no voice of their own. And as a bonus, your good blog here is nice to visit and look at. Thanks for a very sweet and informative website! Aww thank you so much. And love hearing about your kitty – its amazing how they are all so different in personality and yet we get owned by all of them. thank you for the headlines from Pawsome news! 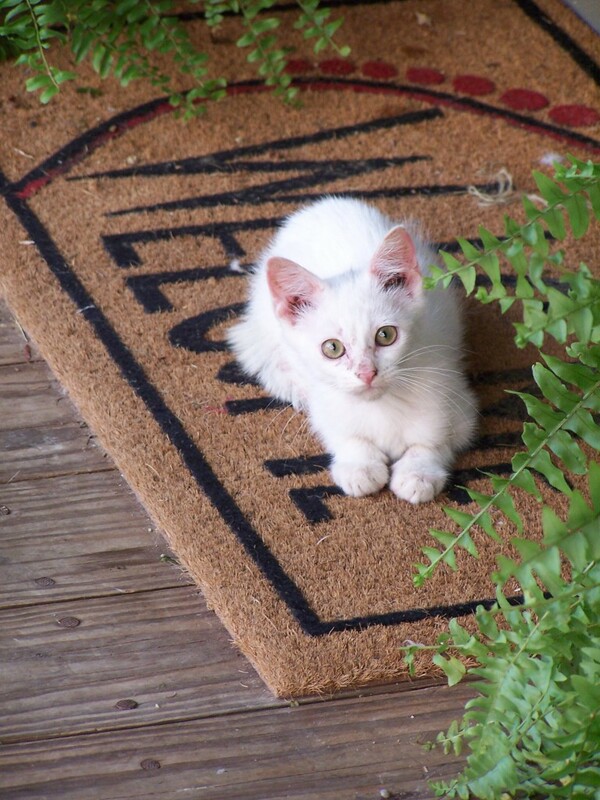 great advice and tips for new kitten owners. Was wondering what you thought of City Kitty toilet training? saw it on Shark Tank and thought it would be great for cat owners that didn’t want the litter box smell. just my luck and I’d get the kitty the fancy bed only to see it favor a cardboard box! Hi Kevin Thanks for your question. I was planning on trying that method when I moved to my new apartment but Dyson took matters into her own paws and used the human toilet straight away (she does still use her litter robot as well). She had access to her own bathroom which wasn’t used by humans so was used to using the bath’s plug hole (usually a direct hit) so it wasn’t a big step up – now I just have to teach her to flush. If I got a new cat though I was going to give this a go. I am so pleased I found this site! You have included so much useful information in just one post! My 10 year old son wants to get a kitten but being allergic to cat hairs I am not so keen. Are there cats that shed less hair than others? Also, from what age would you say that a child could look after and take responsibility for a cat on their own? Hi thanks for your message. It’s actually the cat saliva that most people are allergic to (it’s usually a specific protein in the saliva) and then when the cat sheds you get more exposure to it. Cats like the Bengal don’t produce much of this protein (and they have a definate personality). You also have Cornish and Devon Rexes which don’t shed very much, Siberians which are long haired and again don’t shed much and Russian Blues which only shed in about a two week timeline each year. It’s always dependant on the child’s maturity level – I had cats and dogs from a young age but at first my interaction was supervised so that I would get used to how much more delicate cats are than humans. Now I know what to help my gf with after she decides on a kitten. I will surprise her to no end with my newfound knowledge (she knows that I had never had cats before), LOL! I love your article, not only because of all these cute pictures but also lots of helpful informations. My daugher loves cats and I think it’s just a matter of time when we get a little kitten.